Update: Bookings for this course have now closed. Click here to find any Holistic Decision Making courses we have scheduled. Holistic Decision Making is an acclaimed technique that allows you to learn how to make great big decisions, and ongoing smaller ones – for your family, enterprise or farm – based on the fundamentals of what matters most to you. Maybe you’re about to do some succession planning? Or deciding on which piece of land to buy? Or whether to move cities? Or maybe another big decision that you really want to be sure is right? This is what Holistic Decision Making provides a framework for. And also what this workshop is for, to help you learn the skills to do this yourself, with certainty. 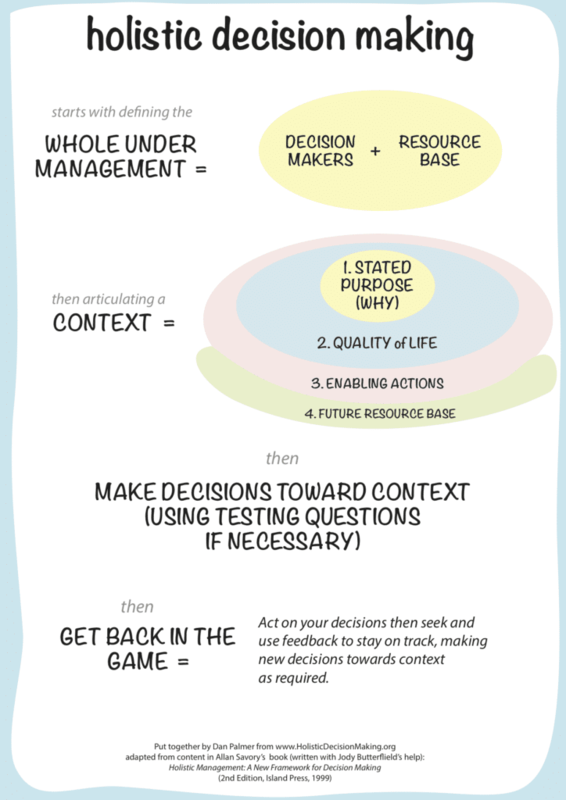 What is Holistic Decision making? Holistic Decision Making is a rock-solid platform for making great things happen in a way that increases the quality of life for all involved. 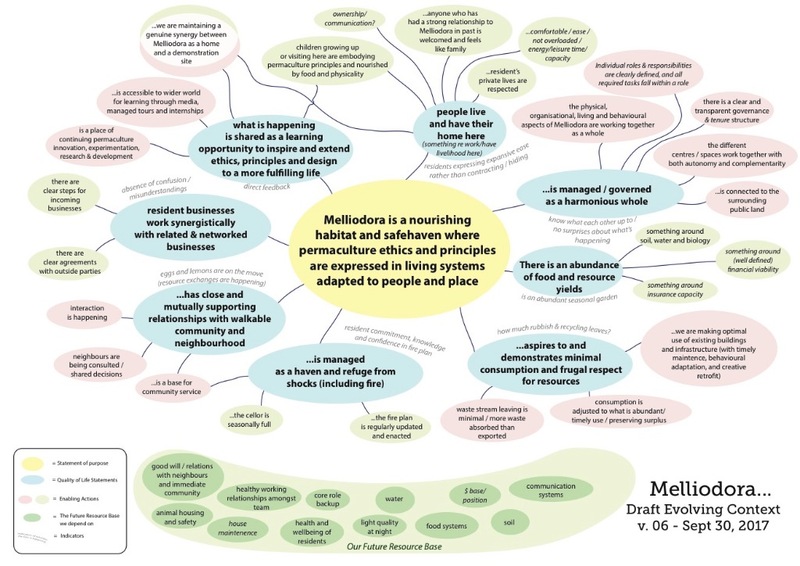 Originally used to make best-possible decisions around farming and grazing which benefited both the farmer AND the land, holistic decision making is a framework now used to steer businesses of all types, as well as provide structure for making excellent family decisions and community decisions. Holistic Decision Making allows anyone to lay groundwork for a successful future – farm, family or enterprise – by defining what is core to those involved. From there, you can define a best-scenario context, and from there, test future decisions against what you truly want. It’s a way of ensuring you take the future as it comes and use opportunities to your advantage, rather than being swayed or driven by chance and impulse. In a world out of balance, holistic decision making is a powerful tool for any enterprise or family to stay firmly on track, and to enable a future driven by what matters to you most. Holistic decision making can be applied to yourself, your family, any business or project you are part of. We can apply it to all of these things and more. This course is designed for anyone who’s ready to start applying holistic decision making to their lives – a framework for making great decisions for yourself, your business, your farm or whatever your context may be. You will leave this workshop hungry to go back into your life and make decisions given they are the only steering wheel you get in this life to move toward what most brings you and your projects alive. Be warned though – this workshop is not a sit back and soak it up affair. You will not only hear about this approach. You will practice it, repeatedly, with much friendly feedback. You will explore and articulate what matters most in the various aspects of your life. You will improve your focus and clarity of purpose as well as learn how to steer directly into the space you most deeply want to be in, and stay there. The entire approach clearly explained using examples from the facilitator’s lives, games and practical exercises. Creating what we call a ‘context’ for yourself, your family or an organisation/business you are part of that captures deepest values, mission and desires along with what must be done and nurtured to achieve them. Using that context to filter decisions and take actions based on their relevance to this context. Seeking and using feedback to actualise, maintain, and evolve your context. 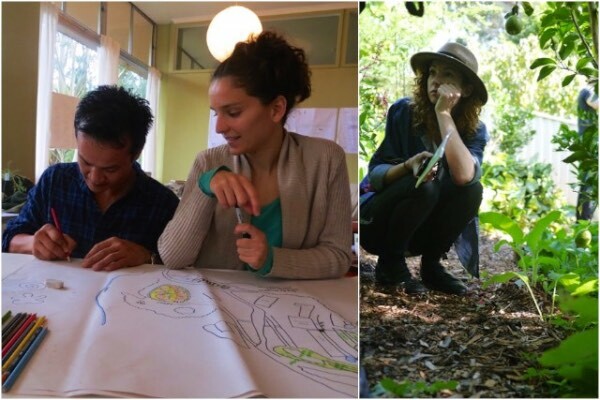 Holistic decision making is something Dan finds invaluable and integral in his personal and family life, and also his work as a permaculture designer and educator. How does this link in with Permaculture? 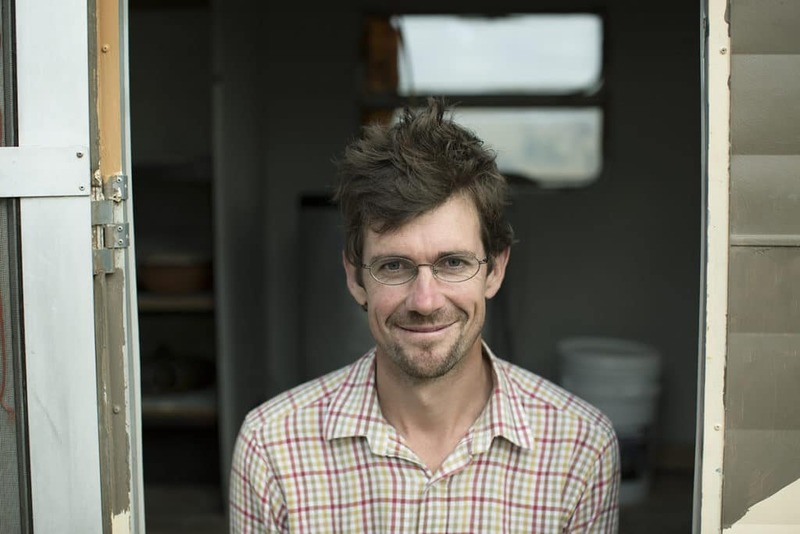 Dan Palmer is co-founder of the Permablitz movement, founder of Making Permaculture Stronger and co-director of Very Edible Gardens – an established urban permaculture design service. 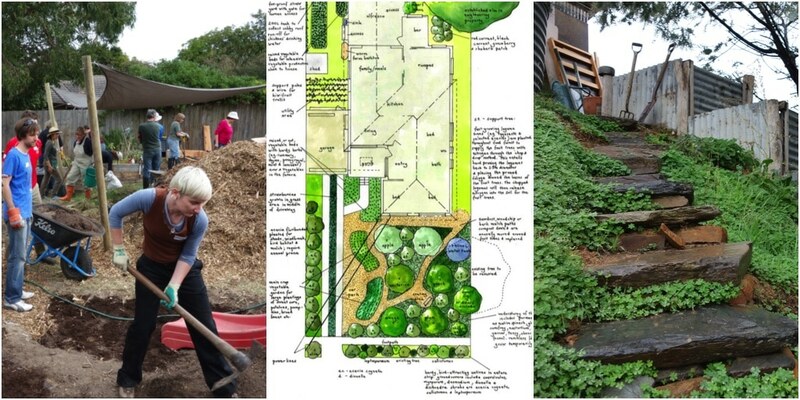 He has two Permaculture Design Certificates and a PhD in Systems Thinking. 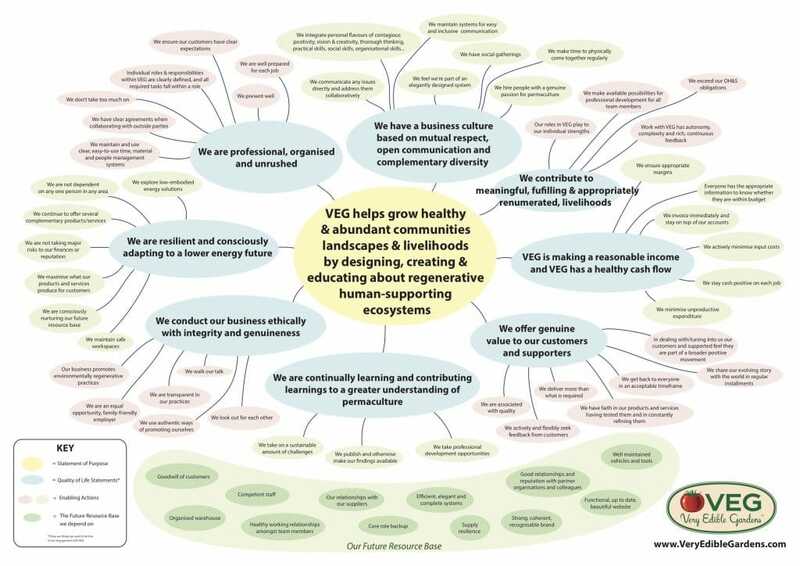 Dan is best known for his thoughtful, whole systems approach to permaculture design, his integration of holistic decision making into permaculture, and his ability to create successful, ethical and effective permaculture businesses. 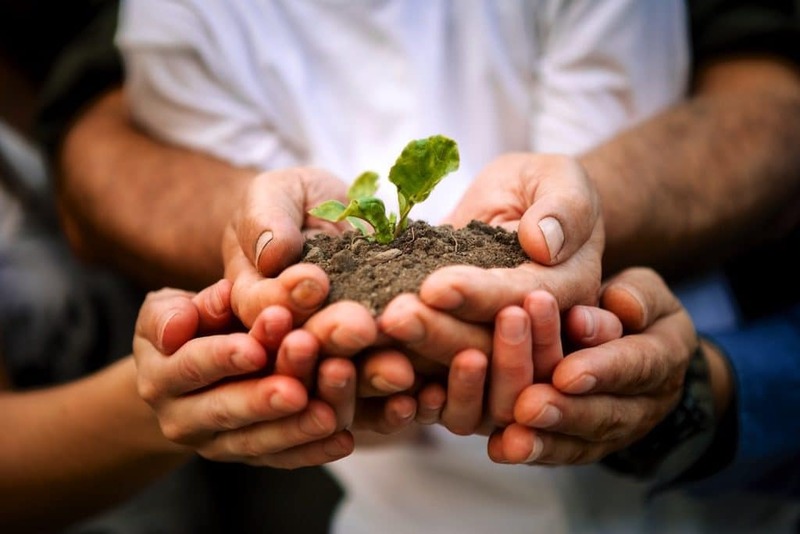 Dan contributes regularly to permaculture and organic gardening publications and courses in Australia and New Zealand. He currently lives with his wife and two daughters in Castlemaine, VIC. Note: Dan Palmer is not formally affiliated with either the Savory Institute or Holistic Management International and is not a certified Holistic Management Educator. While Dan’s presentation of Holistic Decision Making takes its inspiration from Savory’s Holistic Management approach, it is a different approach focused 100% on making better decision making accessible to everyone including non-farmers. For anyone interested in pursuing Holistic Management proper, which focuses primary on grassland farmers, please visit either the Savory Institute or Holistic Management International. 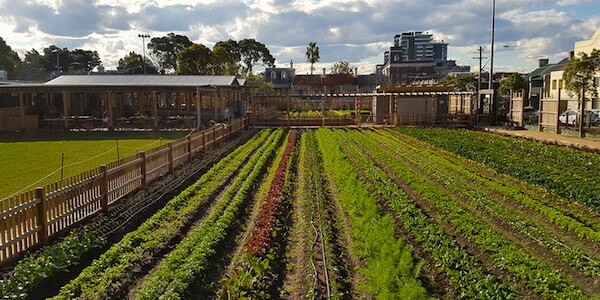 This course will beheld with our partners Pocket City Farms in Camperdown, Sydney. Comprehensive student notes as well as organic tea, coffee and fruit throughout the day. For lunch, there’s an onsite kiosk serving up farm-fresh lunches, or many other eateries nearby. You can pay for your course now with your credit card or PayPal balance or contact us via the form below (scroll down) to arrange alternative payment. Please note that as per our fair share policy we offer discounts to people who would like access to our education programs, but cannot afford it. If this is you, then please get in touch using the form below. Please ensure you read our cancellation & refunds policy prior to booking your course. Contact us using the form below if you have any questions, to arrange an alternative payment method or to be added to the wait list for a sold out event.